Target Acquired Shipt. Now What? The Amazon-Whole Foods deal has set off a domino effect in the grocery sector. 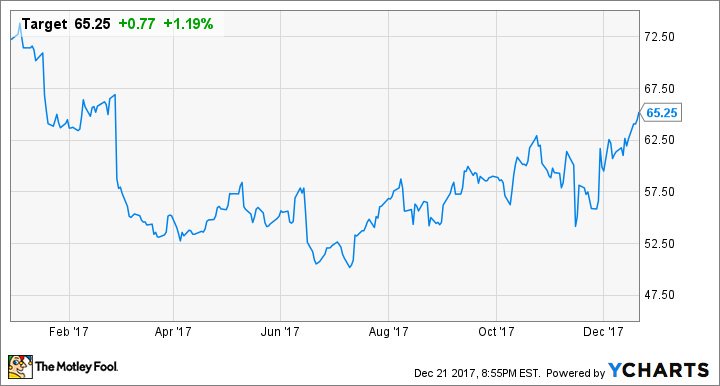 Target (NYSE:TGT) is not giving in to Amazon (NASDAQ:AMZN) without a fight. Last week, the retailer surprised investors by announcing it was buying same-day delivery platform Shipt for $550 million in cash. One person who wasn't surprised by the announcement was Brittain Ladd, a strategy and supply chain consultant who correctly predicted either Target or Kroger (NYSE:KR) would buy Shipt in his June paper Amazon Acquires Whole Foods - Now What?. Previously, Ladd correctly predicted that Amazon would buy Whole Foods in a 2013 paper titled A Beautiful way to Save Woolworths. Once Amazon bought Whole Foods this past June, Shipt's value shot up, and it became a prime takeover candidate for both Target and Kroger as they looked for ways to bolster their offerings in order to compete with Amazon, Ladd said. But now that Target has shelled out over half a billion dollars for Shipt, what happens next? Ladd has some thoughts on that, too. Shipt CEO Bill Smith spoke to Target's Minneapolis HQ team the day the acquisition was announced. Image source: Target. The bottom line is that Target was under immense pressure to start offering same-day delivery to its customers. Amazon, Walmart (NYSE:WMT), and Best Buy (NYSE:BBY) all offer it, so Target needed to figure out a way to do the same. "Target's executive team should be recognized for making a wise decision in acquiring Shipt, showing leadership, and proving they have the courage to execute a business strategy," Ladd said. While most of the dialogue around Target's purchase of Shipt has been around its newfound potential as a same-day delivery grocer, that's not the main reason Target bought Shipt. More importantly, Target finally has a way to improve its last-mile and same-day delivery experience for all products, Ladd said. And that's the best way to compete with Amazon. The last mile is the infamously inefficient and stressful part of the supply chain. It refers to the journey between a distribution center and the consumer, and it's what logistics teams across the country are continually trying to improve. Although that last mile is notoriously expensive for retailers, in the age of Amazon customers expect it to be free. Now with Shipt, Target is starting its own $99-per-year same-day shipping membership program, similar to Amazon's Prime membership program. Target said the service will start next spring. Target's acquisition of Shipt should also be a further warning to the market that it's becoming increasingly difficult for companies to compete against Amazon on their own. And that's especially true in the grocery sector. "I estimate there will be significant M&A activity in the coming five years," Ladd claimed. With two correct predictions under Ladd's belt, many people may be wondering what Ladd sees happening next. His expertise also comes from his time working at Amazon until May of this year on groceries and other initiatives. Ladd says he anticipates Cerberus Capital acquiring same-day grocery delivery service Instacart to leverage its data to help improve the operations at Cerberus Capital-controlled Albertsons, America's second-largest grocery chain. Not only will this give the company access to data on grocery clients and the opportunity to open Instacart-branded stores, but it could also lead to another shot at an IPO for Albertsons. This would make sense considering Albertsons was shopping around for a grocery chain to acquire earlier this year. In March, Bloomberg reported that Albertsons held preliminary talks with organic grocer Sprouts Farmers Market (NASDAQ:SFM). A month later, the Financial Times reported that the grocer was sniffing out a potential Whole Foods acquisition. But of course, that didn't work out. In fact, when Amazon bought Whole Foods, Albertsons reportedly scrapped the plans it had to revive its original 2015 IPO plans by the end of 2017, Bloomberg reported in July. 2017 hasn't been a complete loss for Albertsons as the company quickly purchased meal-kit service Plated in September, just three months after the Amazon-Whole Foods deal sent panic through the grocery sector. Albertsons said it will sell the meal kits in its stores and eventually will deliver meal kits to customers' doorsteps, perhaps with the help of Instacart, if Ladd is right about that deal. As for other deals in the space, Ladd said the possibilities are nearly endless and almost impossible to predict. He could see Target and Kroger merging or Kroger acquiring Overstock.com, Costco acquiring a grocer, or even Walmart acquiring eBay or Salesforce. But the main takeaway is that the players that once ruled this market are having to team up to survive the age of Amazon. It's no longer enough to just be a grocer, and it's no longer enough to offer two-day shipping. Consumers want same-day shipping of all items, and they want it at no additional cost. That's a feat that requires some serious team effort.